Not long after I published my first post on learning to correct my posture, a friend told me I should try Ariel Yoga. She said the inverted postures allowed your spine to hang freely and your head to be “loose and bowling-ball-y.” She said she left the classes feeling taller and straighter, and suggested it might improve my walking posture. There was a studio she’d been going to that was only a few minutes’ walk from my apartment. I was sold. The first class was expectedly awkward. Like any form of yoga, I spent my first day turning my neck around trying to look at the other people and confirm I was doing everything right. 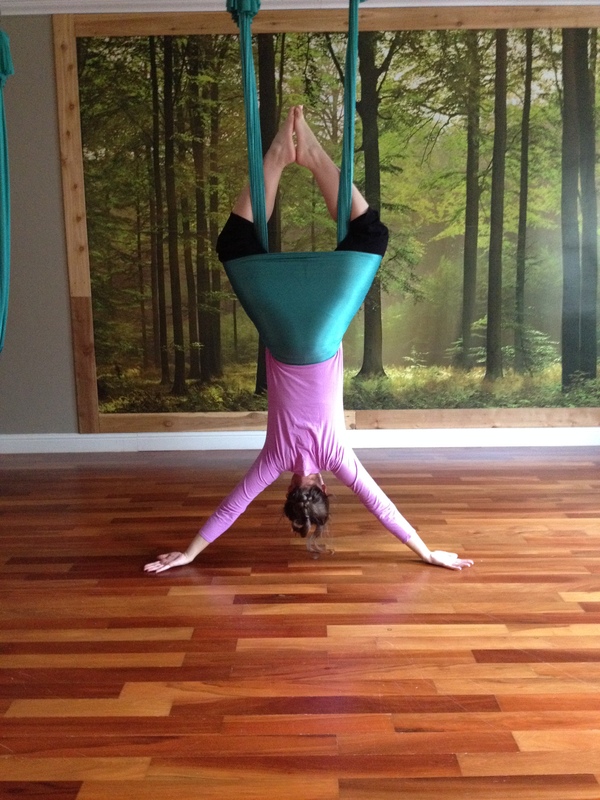 Ariel yoga is done using a large silk hammock to support and alter typical yoga stretches and postures. The hammocks are mostly opaque, but just see-through enough that if you press your face against them you can still see what the teacher is doing. We started class by sitting in our hammocks and doing basic stretches normally meant for the floor. Sometimes the hammock versions seemed less helpful than the standard poses, while others were leagues better in the hammock. I’ve never known a pigeon pose to stretch my hips quite as well as a pigeon pose suspended two feet off the ground. After a few starter stretches to get us comfortable with the hammocks, the inversions began. The most basic is called the Spiderman, in which you hang upside-down with the soles of the feet together and the knees bowed out. You know, like Spiderman. The first moment I did it I felt the effects. Because the hammock holds you up by the pelvis and not the waist or the legs, nothing is straining or yanking. Your entire spine is allowed to relax against the pull of gravity, all the way up to your tailbone. It was amazing. I felt like my lumbar spine was massaging itself. We did a few more inversions that first day, and a few more stretches. Like any yoga class, we ended with the savasana relaxation pose. It was so amazing to be floating in the air with every part of the body evenly supported by a silk hammock. While I still I wasn’t sold on the concept, it was worth trying again. Besides, I’d bought the beginner’s two-class pass. My second class made more sense and involved less peeking through the hammock to see what I was doing wrong. I was still in the beginner level, full of students just as clueless as myself. I already felt more confident in the hammock, and was able to try a few things I hadn’t done the first time. I bought another set of three classes, and started to move on to the All Levels classes. I did a Flying Dog series that was pleasant murder on my hip flexors. I did a one-legged balancing Sun Salute that made all other Sun Salutes seem like child’s play. And in each class I got to flip upside-down and feel the weight of my entire existence empty out of my coccyx like an hour glass. It was great. Unfortunately, Ariel Yoga didn’t seem to have any direct effect on my posture. I still slouched, even on the short walk home from class. I did notice some positive, indirect effects. I was stronger, and there was more movement in my life. Holding myself up at the computer was getting just a bit easier, because my body didn’t feel so stuck in itself. The individual postures and inversions in Ariel Yoga didn’t matter as much as the fact that I was exercising again. I was building muscle again. I had been trying to strengthen my glutes and abs after reading about Anterior Pelvic Tilt, but my yoga practice was working out my whole body. Being inverted felt good on my back while it was happening, but the real benefit was the ab strength I used to get back up. After a couple weeks of classes I decided that Ariel Yoga wasn’t a complete cure for my posture, but it was a fun, easy, and most importantly convenient way to increase my strength and flexibility. I loved that it took less than 10 minutes for me to get dressed and walk to the studio, and that it was challenging but never made me sweat enough to require a shower. Then I heard the news. My precious studio was moving to “a great new space” in Belltown. I’d either have to pay for the bus or pay for parking, and both would require at least a 20 minute travel commitment to ensure I got to class on time. My perfect little yoga situation was gone. And so the search continues.